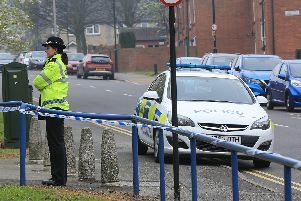 Police in South Yorkshire warned 69 people that their lives were at risk over a three year period, new figures reveal. The ‘threat to life’ notices, known officially as Osman warnings, were given to 63 men and six women between 2012 and 2014. South Yorkshire Police said there were issued in 2014, compared with 19 in 2013 and 16 in 2012. There were eight warnings issued in Derbyshire over the same period. Nationally, police forces have warned more than 1,900 people that their lives were under threat in the last four years. The figures were released by 27 of the country’s 43 police forces under the Freedom of Information Act. The National Police Chiefs’ Council said Osman warnings had proven ‘highly effective’ in helping to protect people ‘in the overwhelming majority of cases’. Osman warnings are issued if police forces become aware of a real and immediate threat to the life of an individual. They were started after businessman Ali Osman was shot dead in east London in 1988 by a teacher who had previously said he was thinking of committing a massacre. Paul Paget-Lewis also shot and wounded Mr Osman’s son, Ahmet, after becoming obsessed with him while working at his school. He was later convicted of manslaughter on the grounds of diminished responsibility.